Semi-arid ecosystems in Australia are responsible for a significant part of the variability in global atmospheric carbon dioxide. Here we use Australian observations to estimate parameters in a land surface model of carbon and water cycles. We quantify the variability in Australian carbon fluxes between 1982 and 2013, including the large uptake in 2011 associated with exceptionally wet conditions following a prolonged drought. We estimate the effect of parameter uncertainty on these estimates. Mild eruption of hydrothermal solutions on deep-sea benthic floor can produce anhydrite crystal layers, where microbes are trapped and preserved for a long period of time. These embedded original inhabitants will be biomarkers for the environment when the hydrothermal eruption occurred. This study discovered a thick anhydrite layer in a deep-sea brine pool in the Red Sea. Oil-degrading bacteria were revealed in the crystals with genomic and microscopic evidence. A box modeling approach reveals that horizontal currents drive the spatial distribution of phytoplankton biomass and primary production in the north-west African upwelling system. Alongshore (cross-shore) currents limit (enhance) cross-shore exchanges north (south) of Cape Blanc. 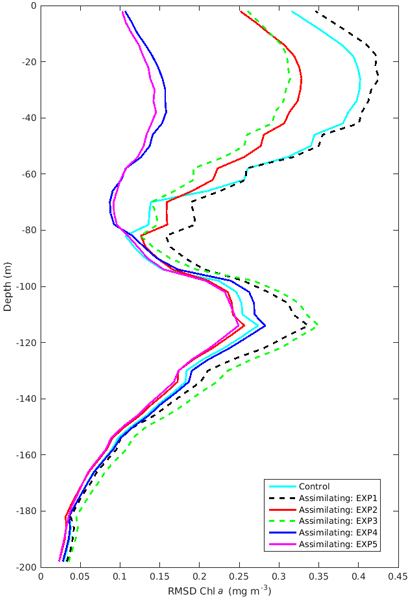 Off Cape Blanc, a meridional convergence makes ambiguous the response of coastal nutrient upwelling to wind forcings, and high production is based upon nutrients and remineralized matter injected by horizontal currents. Marine biogeochemical models are often used to understand water quality, nutrient and blue-carbon dynamics at scales that range from estuaries and bays, through to the global ocean. We introduce a new methodology allowing for the assimilation of observed remote sensing reflectances, avoiding the need to use empirically derived chlorophyll-a concentrations. This method opens up the possibility to assimilate of reflectances from a variety of missions and potentially non-satellite platforms. Warming-induced shrub growth in the Arctic traps snow and modifies snow properties, hence the permafrost thermal regime. In the Canadian high Arctic, we measured snow physical properties in the presence and absence of willow shrubs (Salix richardsonii). Shrubs dramatically reduce snow density and thermal conductivity, seriously limiting soil winter cooling. Simulations taking into account only winter changes show that shrub growth leads to a ground winter warming of up to 13 °C. Deep-sea corals are a potentially valuable archive of temperature and ocean chemistry. We analyzed clumped isotope signatures (Δ47) in live-collected aragonitic scleractinian and high-Mg calcitic gorgonian deep-sea corals and compared results to published data and found offsets between taxa. The observed patterns in deep-sea corals may record distinct mineral equilibrium signatures due to very slow growth rates, kinetic isotope effects, and/or variable acid digestion fractionation factors. Whilst previous studies have focused on the impact of nitrogen on microbe-mediated methane flux, little is known about the role of phosphorus and potassium. Here, we report that P-deficiency-induced changes in soil properties and plant growth state reduced CH4 flux from paddy soil, which was closely correlated with the abundance and community structures of active methanogens and methanotrophs. These results can benefit the effective nutrient management of paddy fields to reduce methane emission.